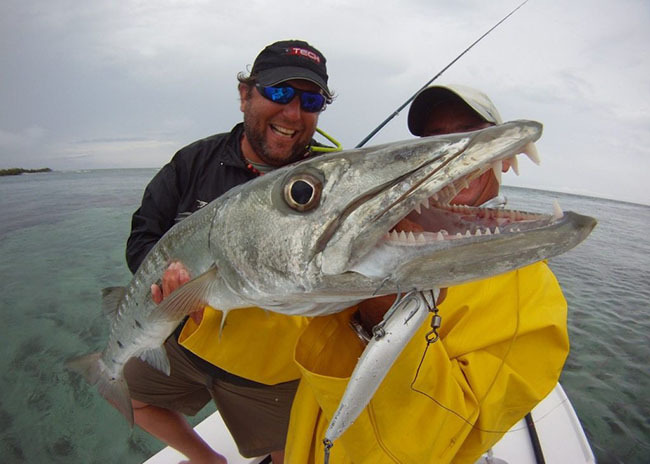 You Are About To Enjoy The Most Exciting Fly Fishing Adventure You’re Ever Likely To Experience! You certainly deserve congratulations for choosing the Cozumel region for your vacation. Not only is the scenery truly breathtaking, it’s also the best fly fishing area for more than 100 miles. You only have a few hours ashore from your cruise liner. You’re staying elsewhere on the Mayan Riviera, such as in Playa del Carmen. You haven’t brought your fishing tackle. ... for example: have you yet experienced the sheer joy of using Orvis or Sage fishing tackle? They’re universally acknowledged to be the very best. Both of these top brands are a sheer joy to use and are guaranteed to enhance your fishing pleasure. But we both know the finest equipment in the world is of little use without an equally top quality native guide to show you the little-known, very best places to cast your fly – which is where I and my family can help you. 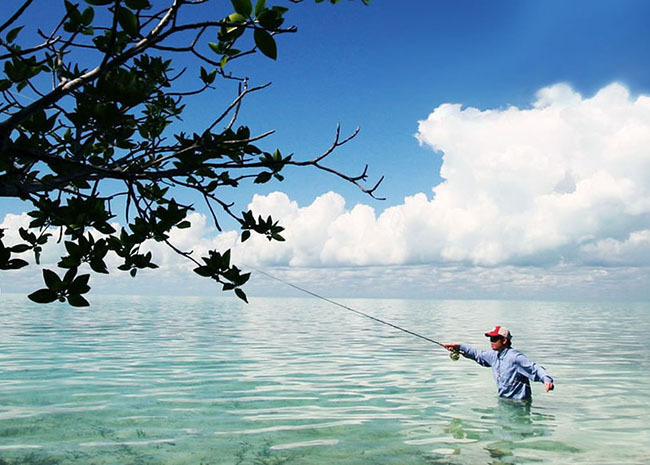 Welcome … my name is Adolfo Vazquez and I’ve been involved in fly fishing in this area for 40 years. And, since 1978, my team and I have been ensuring those problems don’t stop good folks like you enjoying their best ever fly fishing experience. Having spent the last 40 years as a fly fishing guide in this area, I’m truly blessed to number many firm friends among my past clients, who value the fly fishing secrets and local knowledge I’ve happily shared with them. And I’m delighted to tell you my youngest son carries on the family tradition by also teaching fly fishing to our valued clients. What’s more, my oldest grandson has also been helping good folks like you enjoy their fishing trips with us for the past three years. 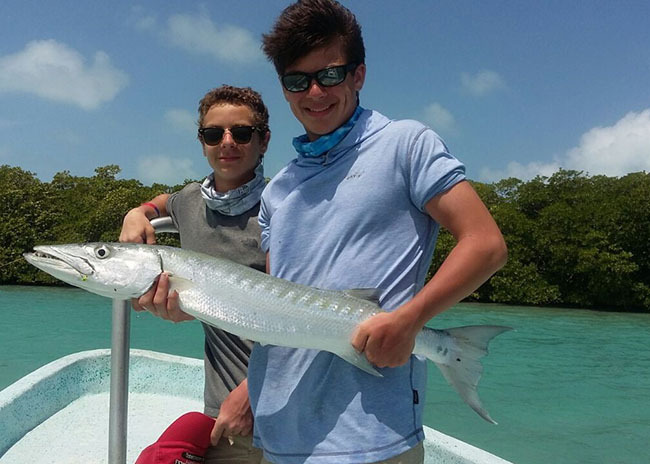 That means our small, enthusiastic team of, mainly family, guides have a total of over 80 year’s experience as fishing guides in these waters. And we have the knowledge and power to ensure your experience will be truly memorable. 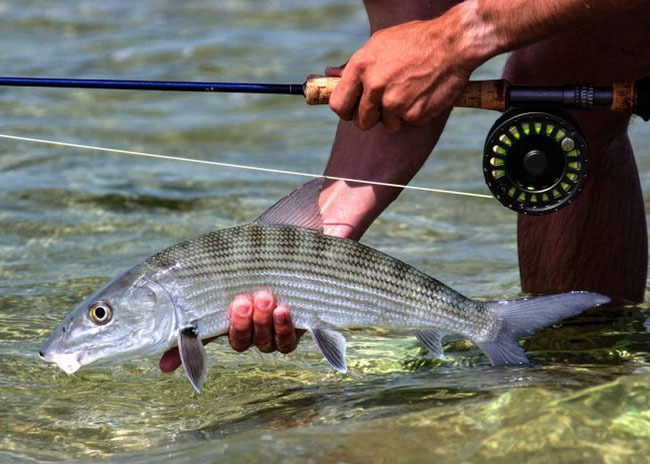 So, whether you’re trying your hand at fly fishing for the first time or are an experienced veteran, you’ll be stacking the deck firmly in your favour by being guided by a team that knows the flats like the backs of their hands and can show you every crafty trick and tip to make your experience totally enjoyable and a rip roaring success. And just imagine the jaw-dropping looks on the faces of your fishing buddies, back home, when you show them photos of the ones that didn’t get away. You’ll feel the excitement rising as soon as we meet and embark for a short ride to the marina, where our little fleet of three Pangas are moored. Then, after a pleasant 20 minute trip, we arrive at the lagoons of Monte Cristo, Paso Balem and Rio de la Plata. 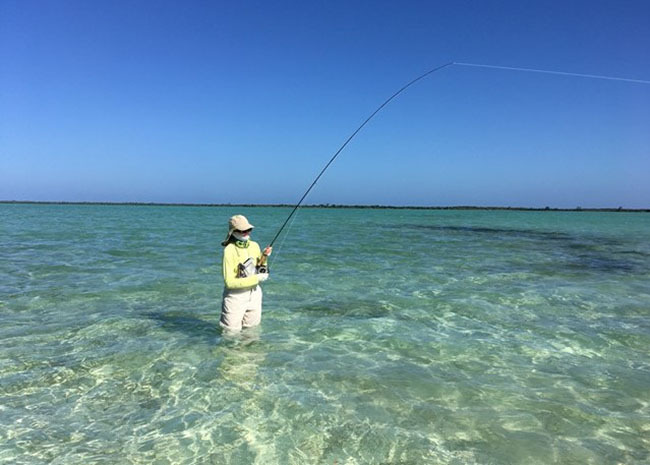 But fear not: because, unlike many other bonefish locations in the Caribbean, our lagoons teem with bonefish all year round. So, whenever you come, you’ll be assured of plenty of sport. 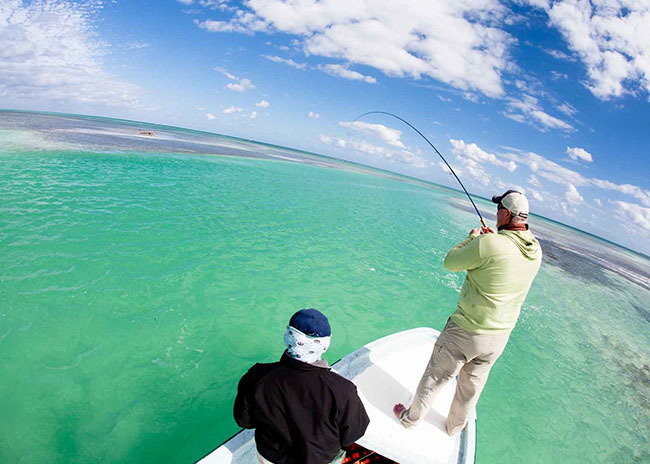 You can also catch permit fish and tarpon, when in season. 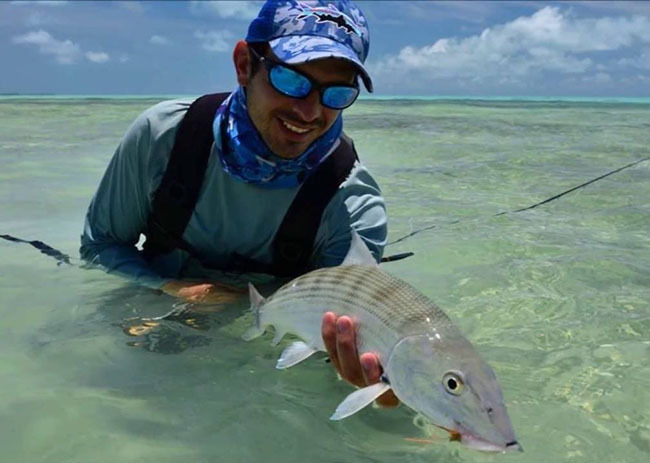 And in no time at all, your guide will be alerting you that the bonefish is tailing and coming towards you – even before you can see it. 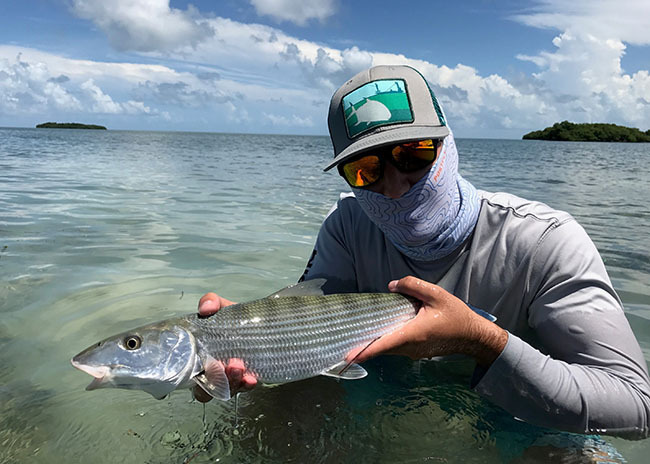 After that, with the help of your guide, it won’t be too long before you enjoy the thrill of catching your first bonefish. And don’t forget the photo of you with your prize to show those envious folks back home! And, when all this excitement has sharpened your appetite, you’ll be ready for a couple of cold beers and a light snack – all included, of course – as is the world-class Orvis and Sage fishing tackle, expertly fashioned flies, lures and even your own fishing licence! 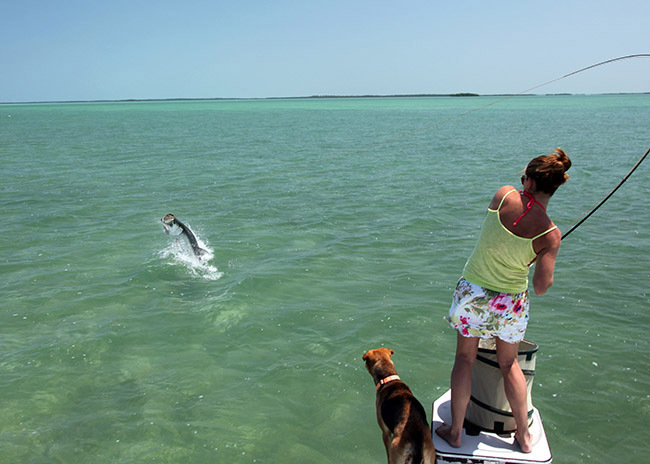 Then, after that, you and the bonefish get another chance to outwit each other. 4 hours - For those Travelers that want to squeeze a quick Fishing trip among other activity they have planned to do while visiting the Island. 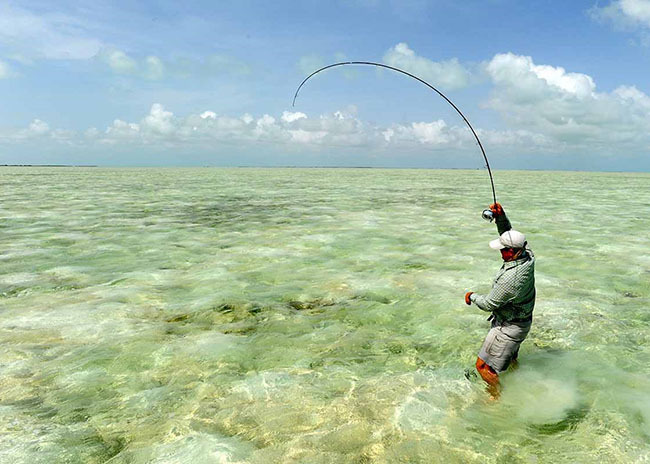 6 hours - Our Most Popular option amongst Anglers that are new to Saltwater Fly fishing. Also the preferred option amongst Cruisers. Your choice of start times: on the hour from 6:00am until 2:00pm.. If you are arriving on a cruise ship, then allow 30 minutes from docking to cover any delay in embarkation. Coming in on a Cruise Ship? You'll arrive at the Cruise Pier, which is just a couple of miles (3.2 kilometres) away. Jump in a taxi and we'll be shaking hands within five minutes! If you are staying in Cozumel: Anyone will be able to point you in the right direction, including the folks where you're staying. And, of course, every taxi driver knows where it is. Coming from Playa del Carmen? You'll arrive at the Cozumel Ferry Pier, from where the 'San Miguel Church, is just a pleasant two block stroll. The staff at the ferry pier will be happy to point you in the right direction or you can hop in a taxi! Meet us at the San Miguel Church in Downtown. About 2 miles from the Cruise Ship Piers. Easy to find us, you´ll have directions in your Confirmation Email. We'll be in the flats in 20 more minutes, around 8am. 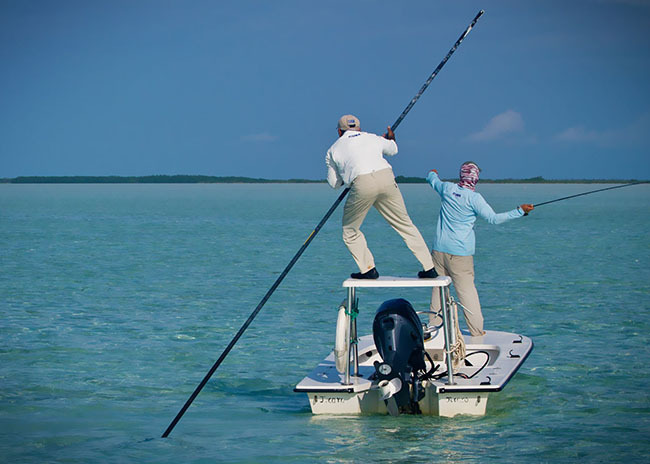 First we´ll wade the Flats for Bonefish. 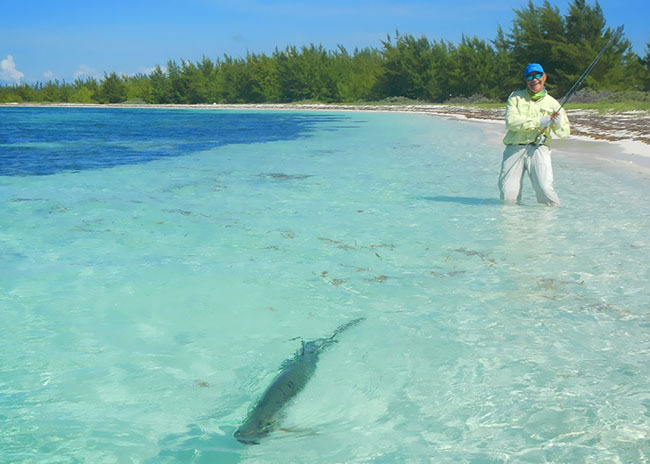 You'll likely see large schools of 18 to 25 Bonefish each school. 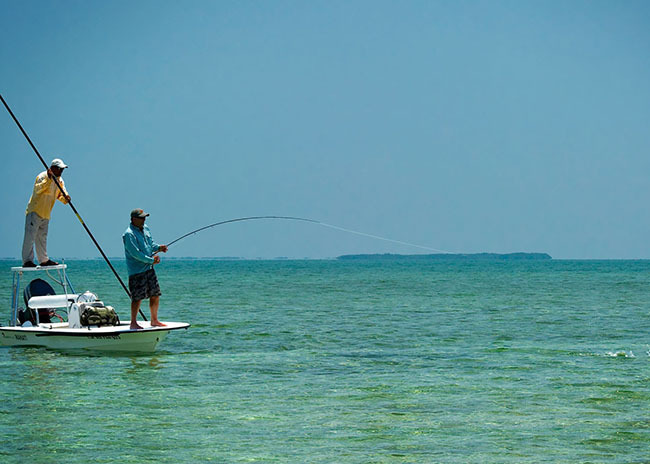 You will be fishing for Bonefish until around 11:30am. Then we stop for lunch, and continue far inside the lagoons number 2 and 3. Laguna Montecristo and Laguna Rio de la Plata. Once we are back in town, we'll drop you off directly at your Cruise Pier. If there's bad weather on the day of your trip and the harbour master shuts down the port for small boats like mine. I will give you a FULL REFUND. Why should you settle for anything less than a life full of wonderful experiences? 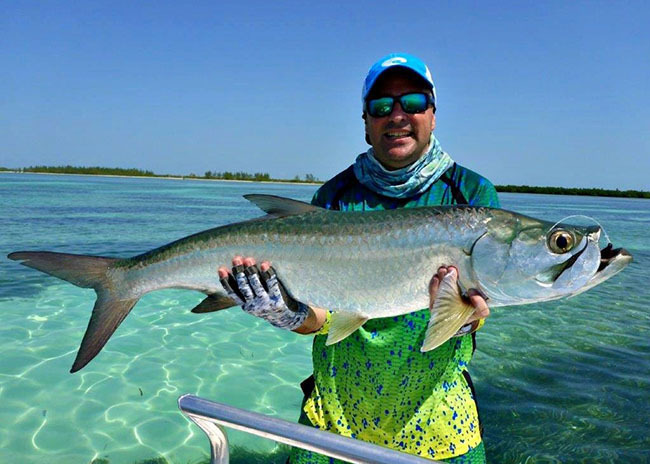 Why should you pass on this golden opportunity to achieve the highest level of fly fishing success by being tutored and cheered on by the very best team of fly fishing guides in the whole Cozumel area – AND gain kudos and the respect of your fishing buddies? … because we are a small outfit we can guarantee a very personal, hands-on attention to our elite clients - but it also means we only deploy 3 boats. And, with about five cruise ships arriving here every single day of the week, disembarking a total of 20,000 visitors daily – plus the folks vacationing in the local hotels – these naturally include many fly fishing enthusiasts, who all want to hire the very best crews. So that means our 3 boats get booked up lightening fast. I thought I’d better mention it, because I’d HATE for you to miss out on a fishing trip of a lifetime, just because I failed to point out how severely limited our slots are. Of course you can ‘think about it’. But, if you do, you run the very real risk of coming back later, checking our booking site (which is constantly updated in real time) and being dismayed to find you have been beaten to it by others and all three boats are already booked up on your chosen day. 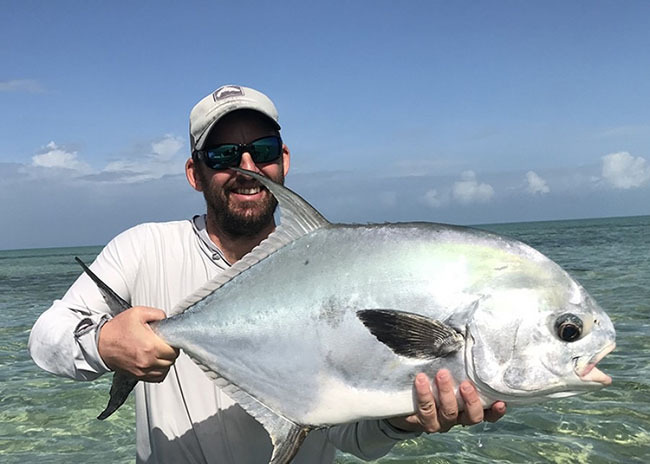 That means, if you only have that one particular day for your trip, you’ll either have to forgo the trip entirely or have to settle for a second rate trip which will NOT necessarily fish in the areas our experienced crew know to be good spots. 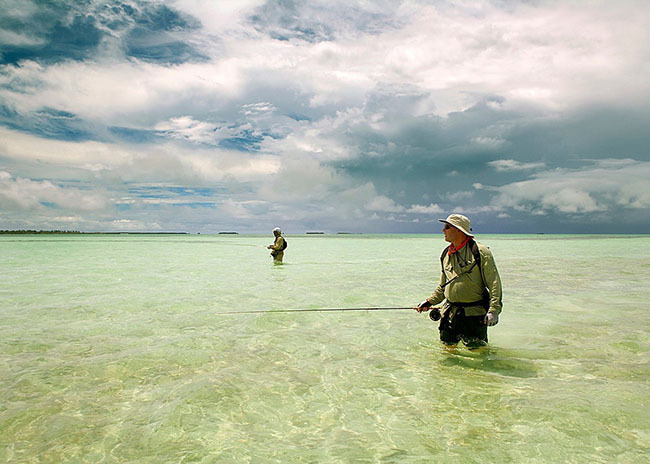 And you might find yourself struggling to understand the broken English spoken by the crew – which can be downright dangerous when fly fishing the flats. You can decide you deserve the best and move swiftly to secure one of the very limited places with our most experienced guides and immediately enjoy a feeling of great calm, because you know with absolute certainty you have made the right choice. So I and my experienced team are really looking forward to providing you with an exceptional fishing trip, the memories of which you’ll treasure forever. 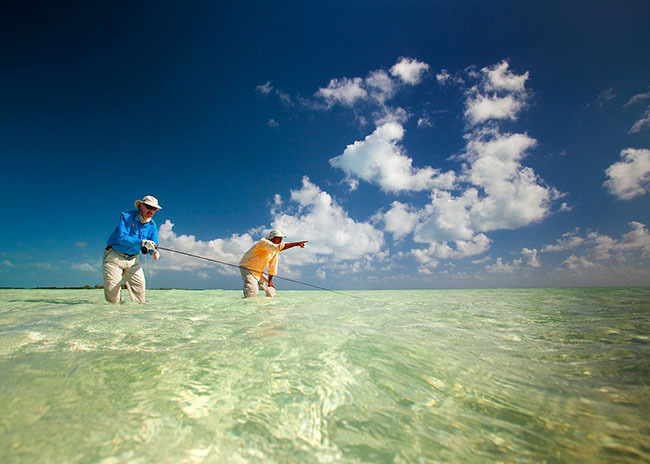 The most experienced team of fly fishing guides in all of Cozumel (with over 80 years of fly fishing guiding between them). Your choice of a 4, 6 or 8 hour trip (no need to miss out on an experience of a lifetime just because you're on a Cruise and only ashore for a few hours – just select a 4 hour trip). You can also decide when we begin your trip – any time from 6:00. am until 2:00.pm. 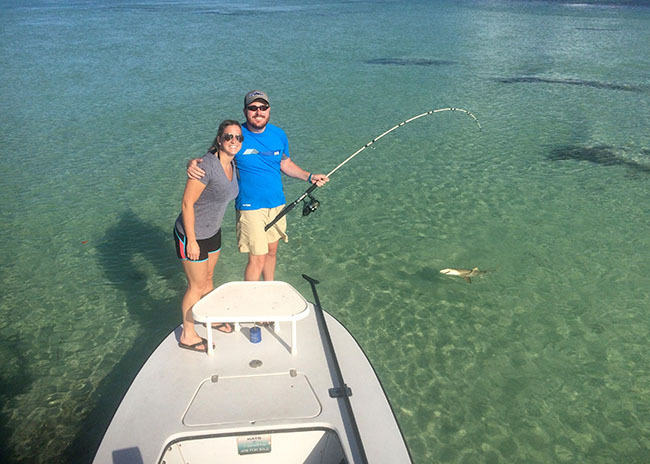 Everything is included – even your fishing license and a couple of cold beers! … you need to book your trip right now, because you’ll hate yourself if you delay and miss out on a fishing trip of a lifetime. I'm coming on a Cruise Ship. How do I get to your Meeting Point? Easy cake. Just grab a taxi at the Cruise Pier and ask the taxi driver to take you to the "San Miguel Church" in Downtown Plaza. The distance is about 1.5 mile and the ride should take less than 5 minutes. I'm coming on a Cruise. For how many hours should I book my trip? This is up to your Cruise's scheduled port time in Cozumel. The average rule is either 4 hours or 6 hours Trip. We suggest you to book your Trip to depart 1 hour after your Cruise is scheduled to dock into Cozumel, because it will take about 30 minutes for the Cruise to allow passengers to disembark once it's docked. CozumelFlyFishing.Net can only be booked online. It is recommended you pre book your tour to avoid disappointment as this is a very popular destination and can be sold out early.